Old town in the government of Kovno, district of Telshi, Russia. Among the earlier rabbis of Plungian were Jacob b. Ẓebi, a resident of Grodno, who gave his approbation to his younger brother's work, "Ohole Yehudah" (Jessnitz, 1719), and Dob Bär, who in 1726 addressed a halakic question to R. Ezekiel Katzenellenbogen of Altona (responsa "Keneset Yeḥezḳel," No. 7, Altona, 1732). Its most prominent rabbi in the nineteenth century was Jehiel Heller, who died there in 1861. Hillel Libschitz (b. 1844), formerly of Suwalki and now (1905) rabbi of Lublin, officiated at Plungian from 1878 to 1880. 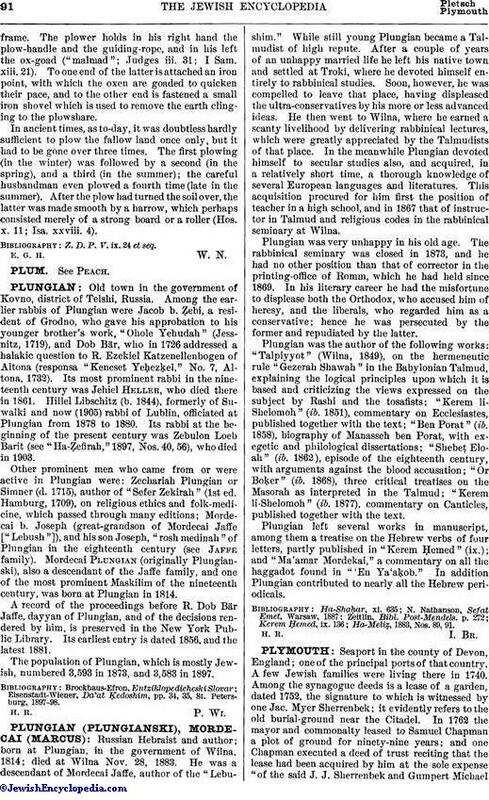 Its rabbi at the beginning of the present century was Zebulon Loeb Barit (see "Ha-Ẓefirah," 1897, Nos. 40, 56), who died in 1903. Other prominent men who came from or were active in Plungian were: Zechariah Plungian or Simner (d. 1715), author of "Sefer Zekirah" (1st ed. Hamburg, 1709), on religious ethics and folk-medicine, which passed through many editions; Mordecai b. Joseph (great-grandson of Mordecai Jaffe ["Lebush"]), and his son Joseph, "rosh medinah" of Plungian in the eighteenth century (see Jaffe family). Mordecai Plungian (originally Plungianski), also a descendant of the Jaffe family, and one of the most prominent Maskilim of the nineteenth century, was born at Plungian in 1814. A record of the proceedings before R. Dob Bär Jaffe, dayyan of Plungian, and of the decisions rendered by him, is preserved in the New York Public Library. Its earliest entry is dated 1856, and the latest 1881. The population of Plungian, which is mostly Jewish, numbered 3,593 in 1873, and 3,583 in 1897. Eisenstadt-Wiener, Da'at Ḳedoshim, pp. 34, 35, St. Petersburg, 1897-98.